There are lots of things to like about Zoolz Cloud Backup for both personal use and business deployment. It combines an easy to follow interface with excellent web management options and the ability to combine cloud operations with local external storage. To avoid any confusion from the outset, this is Zoolz the cloud backup service. And not Zuul, the Gatekeeper Gozer the Gozerian as depicted in the 1982 classic comedy movie, Ghostbusters. The service is based on Amazon Glacier technology, and at this time Zoolz is one of the biggest users of ‘Cold Storage’, providing a cost-effective, secure and dependable solution ideal for archiving and disaster recovery. In use, Zoolz Cloud Backup reminds us very strongly of Carbonite, as the two share a good many features and traits. If you’ve used neither, this is a system to secure a computer in the background, and not inherently a general purpose cloud storage facility. When you first launch the Zoolz-Dashboard desktop application, it tries to automatically provide a smart selection of what needs to be secured, but you have complete control over the folders and files it replicates to the cloud. 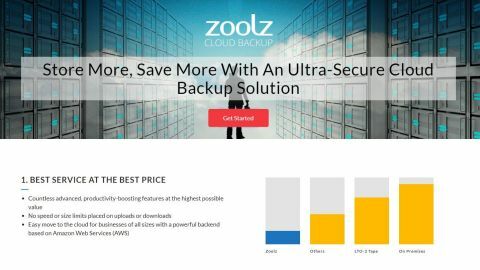 Also, this tool also provides a localised file backup facility to the network or extra drives and combines this with the cloud storage facility to deliver what Zoolz terms ‘Hybrid+ backup’. We like this concept. Because encouraging people to have multiple levels of backup on different platforms is a good practice worth following. Once the parameters of the backup are defined Zoolz-Dashboard then runs and secures all the files and folders at a decent pace. Bandwidth throttling is available for those where the demands on the broadband connection need control, and you can also commit all bandwidth and multi-threaded processing if you wish the transfer to happen quicker. What’s different about Zoolz is that it doesn’t offer a live backup, or keep an eye on any folders it duplicates. Instead, it secures them at a specific timeframe that can be every 5 minutes or longer periods. Periodically, a full scan catches any files that were open during the regular sync cycles. While this puts less stress on the client computer, you could still experience the pitfall of creating an important file and shutting down your computer before an offsite copy is secured. To test Zoolz, we used a free trial that offers prospective customers 15 days of use with 50GB of space to experiment. However, it would put up warning signs telling simultaneously that our trial would expire in 15 days, and it had already expired. We can appreciate that getting customers to commit to an upgrade is vital from a commercial viewpoint, but this sort of badgering doesn’t help its cause. The client tools are straightforward enough and easy to manage. In addition to being able to set filters based on set locations and file types, you can also click on a file or folder in Finder or Explorer and mark it explicitly to be backed up or ignored. This functionality is ably supported by other features in the web interface. On one level this can be used to move and restore files ad hoc to the cloud, but also to move items into ‘Cold Storage’ where they’re meant to be kept in the long term. For business users, the web interface has a good management console where you can see all the computers that are using the account and also the users and their associated actions. Each user can have specific policies created for what it backed up, how often and what privileges they have to store files. Where most personal users will consider this overkill, IT professionals will be delighted by the granularity of what Zoolz can manage within a cloud storage solution. You can also run reports on client activity, bandwidth usages and many other aspects of Zoolz activity. The client tools for PC and Mac and the web interface are the focus of this solution, although Mobile Apps are available for Google Android and iOS. However, these apps don’t secure mobile devices. Instead, they provide a means to access files backed up by computer or stored on Zoolz through the web interface. That’s a slightly confusing choice and makes us wonder why these tools don’t copy pictures to the cloud from them so they could be easily synced back to desktop systems. All files dispatched to Zoolz ends up on an Amazon Web Services system, and by default is encrypted using AES 256-bit algorithm. Transport layers protect them on their journey to and from there. The encryption on storage can be done either with a password that Zoolz also holds or a completely private key that only you have. The latter option is a better security model, but Zoolz won’t be able to help you reset the password should you be silly enough to forget or misplace it. Oddly, given how strong the main security options are, that they don’t also offer two-factor authentication alongside. Exactly how much you pay for Zoolz is dependent on the sized based plan, and if you take a one, two or three-year subscription. The plans offer 1TB, 2TB, 5TB, 10TB, 20TB and 50TB, and range from $16.83 (£12.50) to $730 (£563.50) per month if you agree to pay annually. That makes the yearly cost of 1TB on the expensive side at $199 (£149.99), although you can knock 30% off that if you’re prepared to sign up for three years at a time. However, included in that you get unlimited users and servers, AES-256 bit encryption, and all your files get to live on Amazon’s AWS ‘Glacier’ servers. That begs the question as to why not use AWS directly, but Zoolz does provide a support centre with 24/7 service, and some neat user management tools. But probably the biggest selling points of this service are the almost complete lack of control limits by the provider on the speed of transfers or the size of secured files. Without having to dance around those controls, Zoolz is much easier to integrate into an IT strategy and scale where necessary. At this time Zoolz has server installations that use Amazon AWS facilities in North America, the UK, Australia and Tokyo, and is expanding its global coverage. If want the data to reside in a particular geographic location, even if accessed from elsewhere, Zoolz can organise this for you. We liked the Hybrid backup solution, and that the ten older versions of files are kept indefinitely, rather than being flushed away on a monthly basis. If it has a weakness, it is that Amazon Glacier isn’t renowned for being especially fast if you need to restore from it, and therefore this solution might not be ideal for those with a big system that might need to reconstruct quickly. How to choose a cloud storage or cloud backup provider? Mathew Porter shared his agency's own experience/process when choosing a cloud storage provider. Who: My example business, a theoretical online retailer of dog coats, solely online to the consumer market. Knowing your business will aid in the process of outlining what data will be stored as part of the backup process. What: The data we are going to be storing to our cloud backup solution will be our website, product, sales and customer data, which does not include payment information. This data will be compressed in to a gzip file and automatically transferred to the cloud storage from our web server that runs cPanel. Knowing what data is being stored, the format and how it will be backed up, you will be able to outline requirements when analysing providers. Where: We are wanting to store our data in the cloud as an additional offsite backup location. As we operate within the EU, we must comply to data protection legislation/laws such as GDPR and PCI and the provider must also comply to these. Outlining aspects of the legislation that both parties must comply to will help to identify which providers meet the requirements. When: Our example business will be sending roughly 1GB gzip backup to the cloud storage twice a day, retaining each backup for 30 days. Knowing a rough file size, multiplied by the amount of backup instances (1GB x 2 x 30 = Roughly 60GB) will not only outline the storage space required but also allow us to pose the question to potential providers that they will be able to support the data transfers at the frequency rates outlined. Why: Our theoretical business requires an offsite backup to be stored in addition to our internal backup that is stored offline. This will provide our business with multiple disaster recovery solutions that cover both scenarios off offline or online data loss. Knowing the reasons that a solution is required aids in the assessment of deciding if a cloud solution is actually required.